The vision of Skinner North Classical School has always been to replicate the success of Mark T. Skinner Classical School and to ultimately be the premier elementary school in metropolitan Chicago for educating classical students. 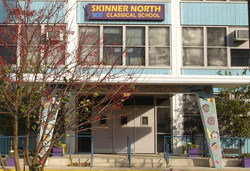 The mission of Skinner North Classical School is to provide rigorous, differentiated instruction to all students. With a focus on teaching the whole child in an academically advanced environment, we work to establish norms of highly successful and socially-motivated individuals in a community that promotes collaboration, leadership, and celebrates the diversity of the students, families, and staff.